Crystal joined our family in May of 1998. She was a cute little, 10 year old Pekingese, in need of a home because her former owner was in poor health and no longer able to give Crystal the care she needed. Paula took her under her wing and introduced her to the rest of our rambunctious pack. 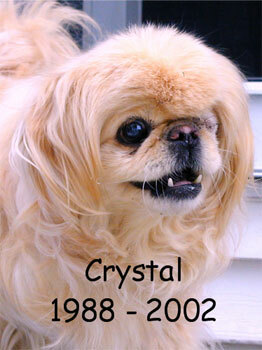 Crystal held her own with the others and never failed to amuse us with some of her silly antics. During the past year her health began to decline. She could no longer see well and making her body do what her mind wanted was more and more difficult. During May she chose to spend more and more time in her crate, and seemed to have lost her spark. 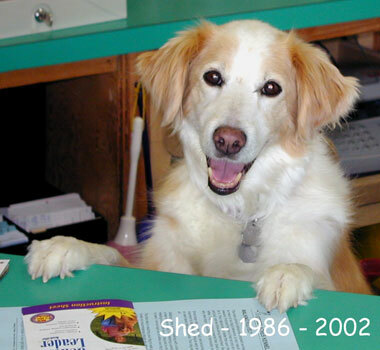 On May 30th 2002 we took her in for her annual physical and made that very difficult decision to help her across the rainbow bridge to be with her old buddy Beau. It was a nice, crisp fall day in October of 1999, when I got out of my car to attend a meeting at the Bangor Humane Society. Immediately I noticed one of the staff walking a little black dog that appeared to be a Cairn Terrier. 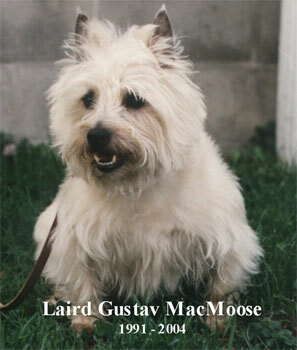 Since Paula and I had been discussing adding a female Cairn to the family, I had to ask about her. It turned out that the diminutive dog was in fact a female Cairn who had been brought in as a stray several days ago and she would be eligible for adoption the following day. The next day I took Paula and the dogs over to meet the little dog and the decision was made, she was joining our family. Shed, Gus, Tikken, Crystal and Tyler all had a new little sister. Laird Gustav MacMoose, better known as Gus, crossed the Rainbow Bridge on Saturday, July 10th, 2004 at the age of 13.5 years. 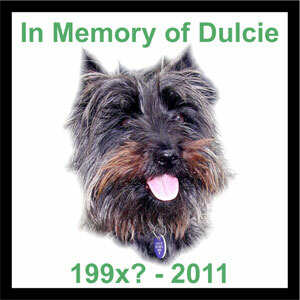 He was the first dog that Paula and I had together and is probably the primary reason we do what we do today. Gus inspired me to start to learn about dog training and his behavioral quirks caused me to delve deeply into the idiosyncrasies of canine behavior. His unusual and frequent health problems were the reasons that Paula and I both started to explore complementary and alternative healthcare, to the benefit of Gus, ourselves and many others. Like Toto to Dorothy, Gus was our companion on the road to our own personal and very wonderful Oz, Green Acres Kennel Shop. 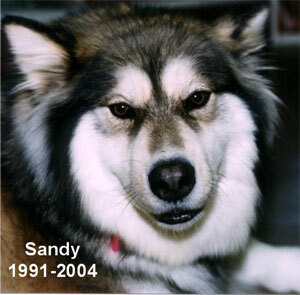 Sandy was a very special boarder who also became a member of our family for a few in 1996. We met her in 1995, the first week we were at Green Acres. Paula and I were still learning the ropes, and I was scheduled to do playtimes. I had always been kind of hesitant about some of the big wolf-like breeds but I had a job to do, so I took Sandy out for a romp in the yard. Sandy and I really hit it off and had a grand time. I think I took her out for play everyday during that visit. When Sandy’s guardian, Margo, picked her up, she was quite pleased with how well Sandy and I hit it off. It turns out Sandy had always been afraid of other people, especially men. Sandy and I had each a life changing experience that week. We learned to trust one another and overcome our fears. We each had found a new buddy. We originally adopted Shed as a companion for us and for our 10 month old Cairn Terrier puppy. Gus needed a friend and some "motherly" guidance. We couldn't have asked for a better mother than Shed. We can still fondly remember sitting in our McFarland living room, watching Shed and Gus tear around the sofa in their nightly version of the "puppy races." 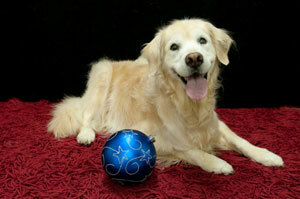 On, January 15th, 2011, our Golden Retriever Tikken (Mariner Freedom Fighter) celebrated her fourteenth birthday. Over the years many have asked "Why Tikken?" Some people have thought it's because as a puppy she was like a clock and always "ticking." There is actually a deeper story and this year through the miracle of Google I was able to learn more about Tikken's namesake. This morning as I opened my Outlook calendar I saw a small notation in purple, the color I use to denote birthdays and anniversaries, stating "Trivia Arrives (1975)." 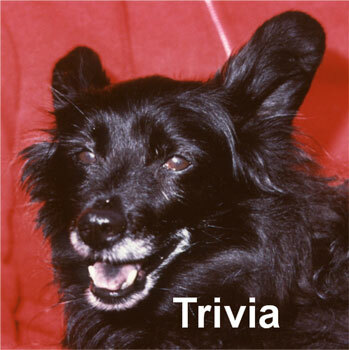 It was thirty-five years ago today that I brought home my first dog, a cute little ball of black fluff I would name Trivia and end up calling "Trivy" for short. 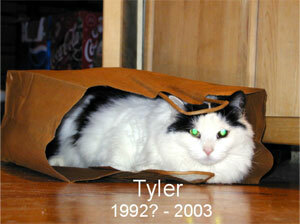 Tyler joined our family in March of 1996, about 6 months after we purchased Green Acres. His previous guardian was looking to place him in a new home, and we thought he would make a welcome addition to our family. We are not sure how old he was when he came to live with us, but suspect that he was at least four. Tyler suddenly developed cancer in August of 2003, and while we kept him comfortable for as long as we could, we decided it was time to help him across the Rainbow Bridge on August 26th.